First it was Cincinnati, then it was Seattle, and then in 2010 Prospero's Books in Kansas City claimed the distinction of having hosted the longest poetry reading on record: 120 hours straight. 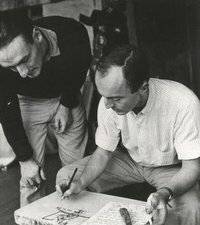 Now northern Ohio, with its growing reputation as a hotbed of great poetry, is poised to seize that distinction. 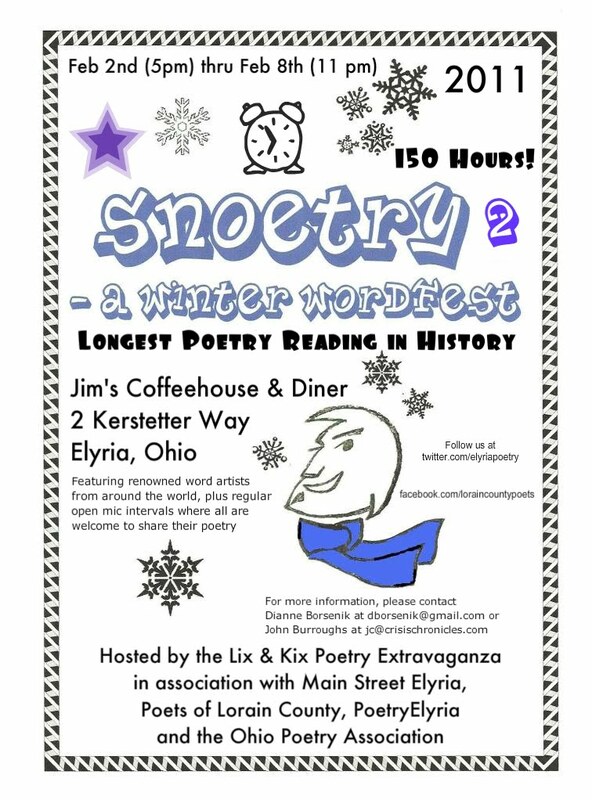 Beginning on Wednesday February 2nd at 5 p.m., poets from several states and as far away as Nepal, led by many of northern Ohio's finest, will overrun Jim's Coffeehouse in Elyria to hold a 150-hour poetry reading billed as Snoetry 2: A World Record Winter Wordfest. The marathon is scheduled to wrap up on Tuesday February 8th at 11 p.m. If you're interested in a 30-minute featured reader slot for Snoetry 2, contact John Burroughs ASAP at jc@crisischronicles.com or on Facebook. For other queries, contact Dianne Borsenik at dborsenik@gmail.com or on Facebook. For a constantly updating list of scheduled readers and open slots, click here. Visit Snoetry 2's Facebook event page here. And for blow by blow updates from Snoetry 2, follow @ElyriaPoetry on Twitter. Jim's Coffeehouse and Diner is located at 2 Kerstetter Way (formerly Lake Avenue) in downtown Elyria, Ohio. Click here for directions. Snoetry 2 is a Lix and Kix Poetry production, in association with PoetryElyria, Poets of Lorain County, Main Street Elyria, and the Ohio Poetry Association. 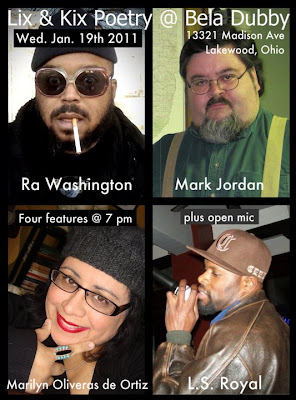 Thanks to the generous support of the Nordson Corporation Foundation, Snoetry 2 will be streamed live over the internet, both here at Cleveland Poetics and at John Burroughs' Crisis Chronicles. Award winning poet and science fiction author Geoffrey Landis (who's also a regular contributor to Cleveland Poetics - The Blog) will be a featured reader this Sunday, January 30th, during PoetryElyria at Jim's Coffeehouse and Diner, 2 Kerstetter Way in Elyria, Ohio. Art Books Cleveland's Bonné de Blas and globetrotting Nepali poet Yuyutsu R.D. Sharma will be featured as well. 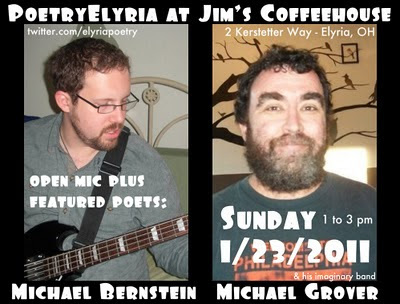 The festivities will begin at 1 p.m. with an open mic emceed by Elyria poet John Burroughs. Hope to see you there! 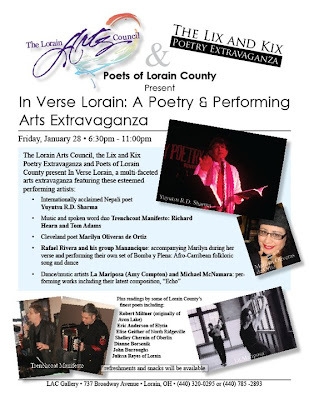 On January 28th at the 737 Gallery in Lorain, Ohio, the Lorain Arts Council, Poets of Lorain County and the Lix and Kix Poetry Extravaganza will present In Verse Lorain: A Poetry and Performing Arts Extravaganza, featuring performances by Yuyutsu R.D. Sharma, Robert Miltner, Trenchcoat Manifesto, Elise Geither, Eric Anderson, La Mariposa and Michael McNamara, John Burroughs, Dianne Borsenik, Shelley Chernin, Julissa Reyes, Marilyn Olivares de Ortiz and Manancique. Corresponding with this event will be an exhibition of art works in a variety of media (including acrylic, oil, and watercolor paintings; sculpture; wood-work; metal-work; photography; mixed-media work; and Ukranian eggs) by Lorain Arts Council members. 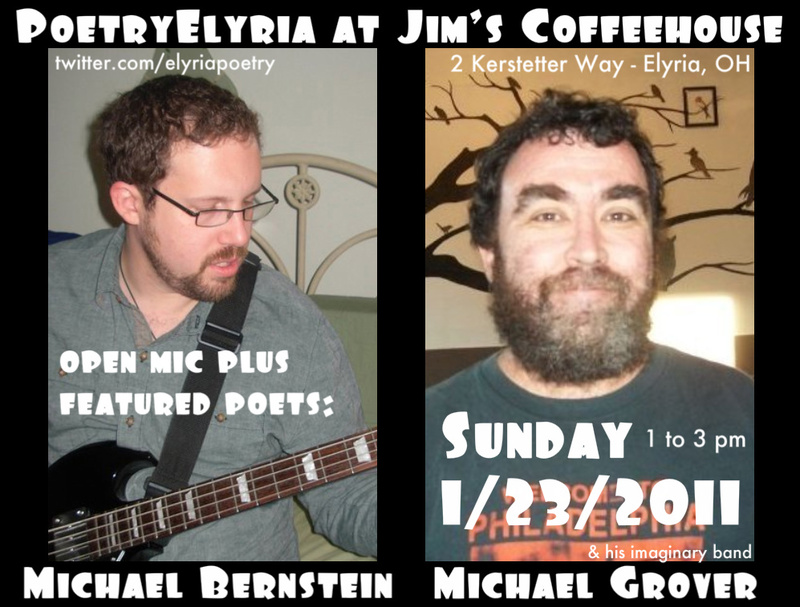 Michael Bernstein of Cleveland Heights and Michael Grover of Toledo will be our featured poets on Sunday January 23rd from 1 to 3 pm during PoetryElyria at Jim's Coffeehouse and Diner, 2 Kerstetter Way in downtown Elyria. 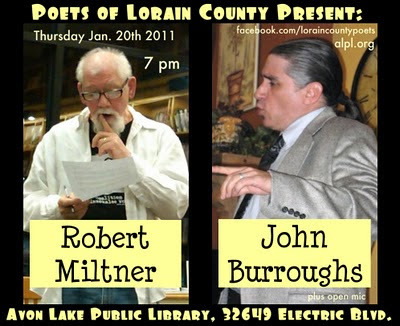 The event will begin with an open mic emceed by John Burroughs. From Claire McMahon: "Please come to the opening of Intersections tonight. The opening begins at 7pm, and at 8pm, the poetry reading will begin. 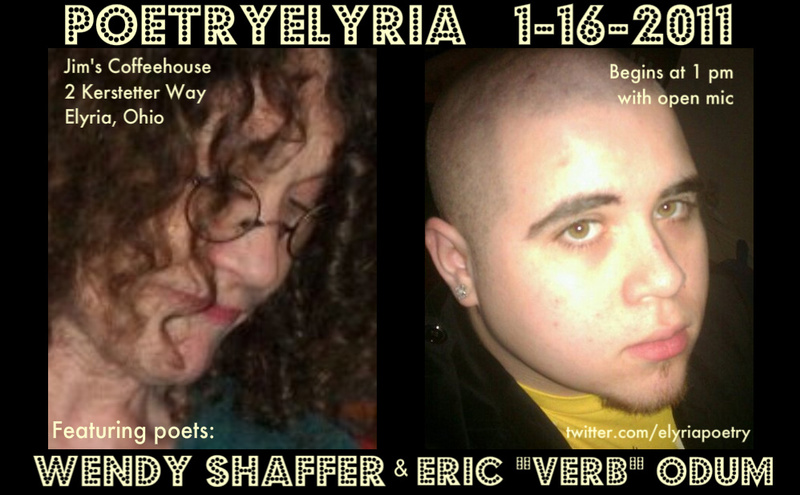 Poets will read from poems that have been chosen for the show. Poets involved are : Eric Anderson, John Donoghue, Thomas Dukes, Sarah Gridley, Susan Grimm, Claire McMahon, Ray McNiece, Phil Metres, and Lou Suarez. Come down to see the visual/verbal displays!" 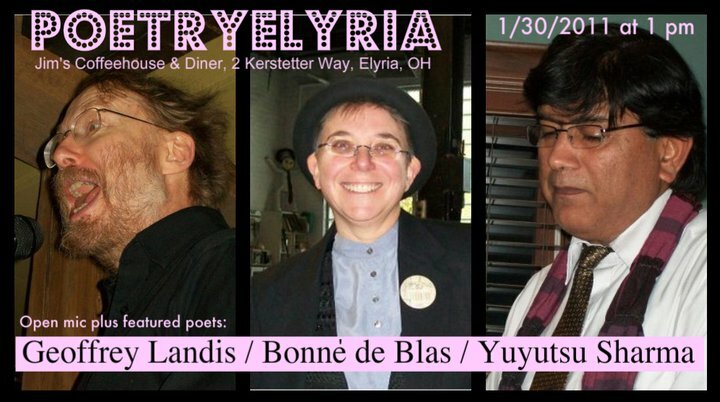 Avon Lake Poetry series launches tonight (1/20)! Event will begin with an open mic. Bring your poems, munchies, soft drinks. Visit our Facebook event page here. 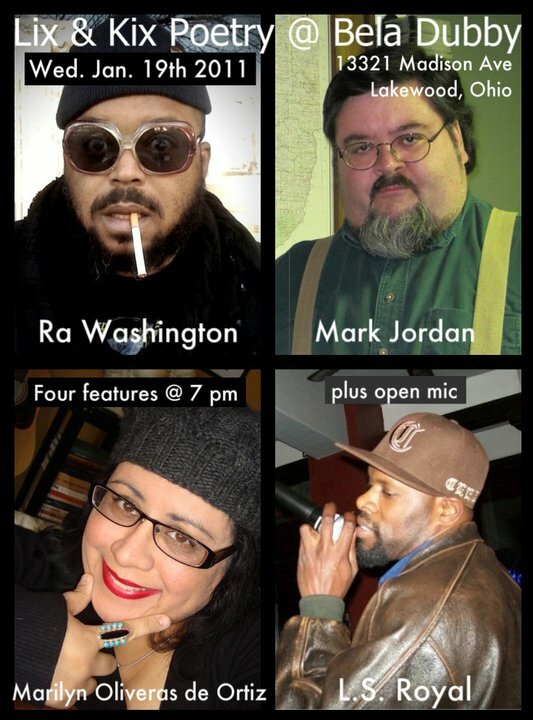 Wednesday January 19th from 7 to 10pm, The Lix and Kix Poetry Extravaganza will present featured poetry by RA Washington, Mark Jordan, LS Royal, and Marilyn Oliveras de Ortiz. As an added bonus, Rafael Rivera and Manancique will perform bomba y plena, Afro-Caribbean song and dance, after which there will be an open mic emceed by Dianne Borsenik and John Burroughs. The whole shebang will happen at Bela Dubby Art Gallery and Beer Cafe, 13321 Madison Avenue in Lakewood, Ohio. More Wendy Shaffer at www.wendyshaffer.com. 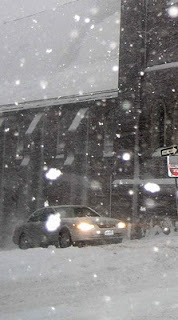 More Eric Odum at http://verbsnotebook.wordpress.com. "Not just rhyme time: Authors bring poetry to area classrooms." "Poems are a fun way to talk to people." 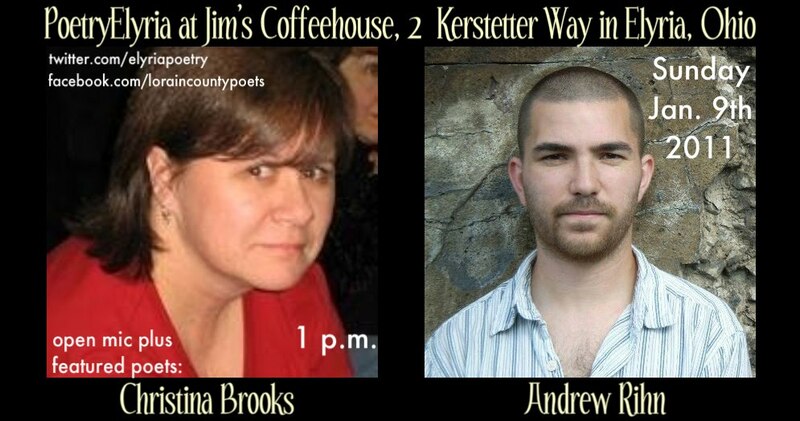 Andrew Rihn and Christina Brooks will be our featured poets on Sunday January 9th 2011 from 1 to 3 p.m. during PoetryElyria at Jim's Coffeehouse and Diner, 2 Kerstetter Way in downtown Elyria (a mere 25 miles west of Cleveland). This event will include an open mic emceed by John Burroughs. For more details, please visit our Facebook event page. Shelley Chernin is a freelance researcher, writer, and editor of legal reference books who writes poetry to maintain her insanity. 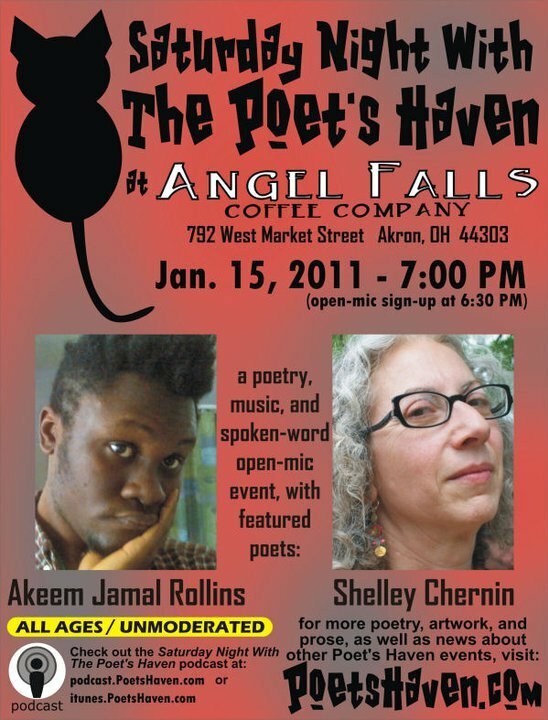 Her poems have appeared in Scrivener Creative Review, Rhapsoidia, What I Knew Before I Knew: Poems from the Pudding House Salon-Cleveland, the Heights Observer, and the 2010 Hessler Street Fair Poetry Anthology. The Akron Art Museum awarded her Honorable Mentions in its New Words Poetry Contest in 2009 and 2010. She recently moved from eastern Cuyahoga to Lorain County, where she's enjoying the measurement of snowfall in inches rather than feet. 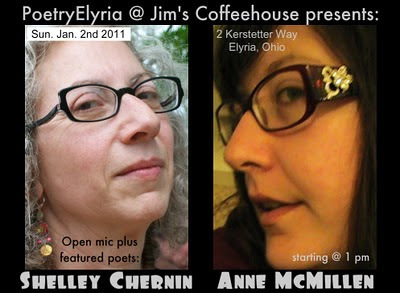 Anne says: "My full name is Anne McMillen, I'm 29 and was born in Elyria Ohio. I went to college for several semesters at LCCC and then on to Bowling Green State University until I dropped out to focus on writing. During those years I traveled the U.S. and eventually moved to San Francisco for 5 years. My first published work was at unlikelystories.org when I was 18 years old. I currently have five published books of poems and am working on my first full length novel. My writing focuses on the dysfunctional home life I endured as well as the sociological problems and issues I observe daily. For a living I work as an optician in a welfare clinic and help people who are disadvantaged obtain a better quality of life. I'm queer and unconventional and reside now in Cleveland with my partners whom I love dearly and care for immensely. I spend a lot of time doing outreach with young queers, organizing speakers and entertainment from out of state to come and spread the good word. Right now my life is better than it ever has been and coming from extreme poverty I consider myself a success even if financially I'm not much better off than I was as a child, but I have a very rich life filled with love, friends and a great community."